A recent American study revealed that in recent months, an increasing number of web shoppers clicked on paid search results (such as Google Adwords). According to the study conducted by NetElixir, there was an increase of 11%. The number of web stores advertising via this channel also increased. In comparison with 2008, in 2009, there were about 10 to 12% more advertisers per keyword. Of course, this also resulted in a price increase for advertisers. The prices per click increased especially in the categories of clothing (+10%), consumer electronics (+7%) and flowers and gifts (+6%). Are you also interested in advertising your products in Google’s paid search results? 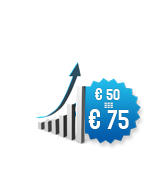 Each Combell customer receives a free marketing budget of 50 euros or 75 euros to advertise in Google Adwords.